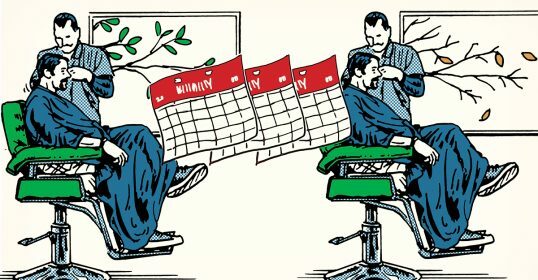 Editor’s note: The AoM Community’s resident style hobbyist, Leo Mulvihill, posted a series of posts on the Community blog to help men understand more about buying, wearing, and looking your best in a suit. We’ll be publishing his entries here every other week. Thanks for sharing your sartorial knowledge, Leo! It’s time for another session of the Art of Manliness Suit School. Today’s topic is quick, easy, and inoffensive: suit buttons. It might at first seem simple – there are buttons. There are holes. The buttons go in the holes. Done. Like most things in life, though, there’s a little bit more to it than meets the eye. Historically, in the early years of the suit as everyday menswear, it appears there were no formal buttoning rules. 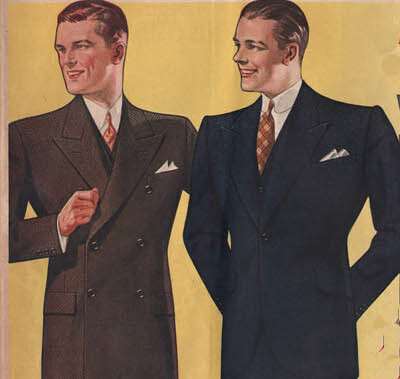 Look to trade magazines and illustrations from the earlier part of the 20th century, and one sees jackets with between one and five buttons, each buttoned in a manner that suited the personality of the wearer or the cut of the garment. But much of this changed with a king who was too fat to button his jacket. Or at least, that’s what legend says. According to the lore of menswear, in the early 1900s King Edward VII started the trend of leaving the bottom button of a suit undone. Apparently, he grew so rotund that he was unable to fasten the bottom button of his waistcoat and jacket. To not offend the king, those associated with him started doing the same. The custom then gradually spread the world round (as England was still largely an imperial power with great influence across the globe). Today’s suits are constructed in a manner where to ensure proper fit and drape of the jacket, one must generally leave the bottom button open. Whether this was started because of King Edward, or simply because of evolving fashion, it remains the rule today. Remember: A suit should always remain buttoned until one sits, when it usually becomes necessary to unfasten the jacket. Once one stands again, the jacket should be refastened. But as any gentleman knows, there are exceptions to every rule. Here’s a cheat sheet broken down by button styles. One-button suits are the easiest to remember. The button should always be buttoned when standing and unfastened when one sits down. No extra buttons to fiddle with or worry about. 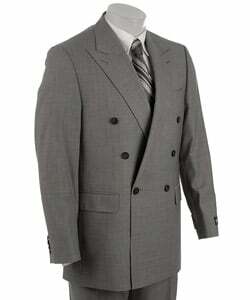 Here’s an example of a one-button suit. This particular suit has peak lapels as well, in the classic tuxedo style. Two-button suits are also simple. The top button should remain buttoned, while the bottom button is left undone. If you button both and look in a mirror, you’ll immediately notice that something looks strange. The bottom button also significantly restricts your movement. With three buttons, you have options. You can either button the top two and leave the bottom unfastened, or simply button the center button. On suits with a lapel that is flat, it generally looks better to button the top two. If the lapel has a soft roll to it that extends past the first button, then it’s advisable to button only the center button. Above is a three-roll-two lapel. You can see a button hole for the top button, but the button itself is hidden from view by the lapel. This jacket should only be buttoned in the center, as the cut and roll of the lapel essentially precludes the button from functioning properly without making a mess of the fabric at the front of the jacket. This is actually my preferred style for jackets. The soft roll of the lapel combined with the symmetrical top and bottom button holes exudes a classical elegance that normal three-button jackets cannot match. Moreover, this is a style that works best with full-canvassed or half-canvassed jackets, which is why I advocate for them so zealously! Nowadays, one doesn’t see as many rolled lapels. So unless your suit has a rolled lapel, it’s better to leave the top two buttons fastened. But keep your eye out for three-roll-two jackets and pick one up if you can. You’ll not regret it. I do not advise that one ever wear more than three buttons on a single-breasted jacket. While they used to be common, nowadays they are more often seen on celebrities and those who want to make a brazen fashion statement. But they are generally neither rakish nor stylish, and you run the risk of being thought a fool if you wear them in a business environment. But if you feel inclined to pick one up regardless, just leave the bottom button undone. Double-breasted suits are pretty easy. Generally, fasten every button except the bottom (but even this is optional; Prince Charles routinely fastens them all for example). Then, leave the suit buttoned until you take the jacket off — whether you’re sitting or standing. The military style behind the double-breasted suit requires that it remain fastened, otherwise the extra fabric at the front of the coat looks sloppy. 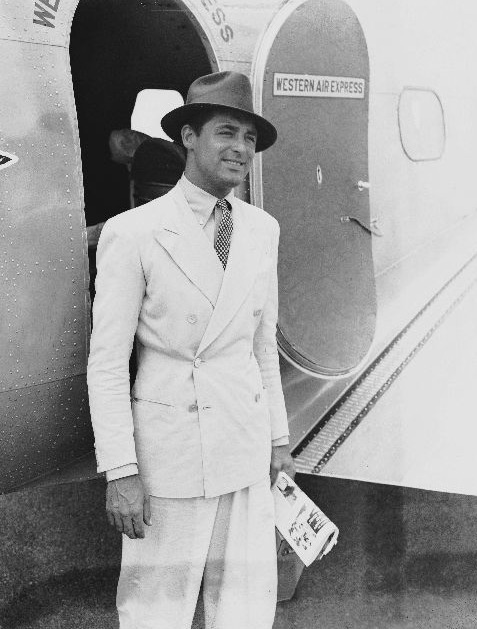 Above you can see Cary Grant in a suave-looking cream 6×2 double breasted — heading somewhere tropical, no doubt! Its button configuration is known as a 6×2 because it has 6 buttons, only two of which can fasten. It is my opinion that this style of double-breasted jacket is most flattering for the greatest number of men. If you notice, the bottom-most button is undone. This improves suit drape and give a nice masculine figure to the jacket. 6 x 1 – Popularized in the late 80s and early 90s. This unfortunate style, worn by Patrick Bateman in American Psycho, now looks terribly dated and does not flatter many men. Please stay away. 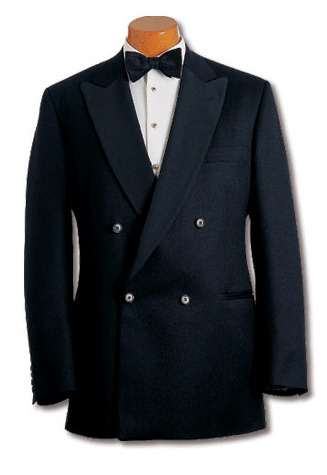 4 x 1 and 4 x 2 – Often seen on the Duke of Windsor, this style of jacket has 4 buttons, of which either two or one fasten. The 4×1 was also quite popular in the 80s, but does not offend my sensibilities as much as the 6×1 . But be careful if you already have a belly, as the 4×1 has a tendency to magnify any weight around the midsection. The 4×2 is more versatile, as one may fasten either the top, bottom, or both buttons. The 4×2 appears far less often in ready-to-wear clothing than the 6×2 or 4×1. 2 x 1 – Just say no, unless it’s a smoking jacket or shawl-lapelled tuxedo. This is an 80s revival look that should stay dead. So whether you prefer one, two, three, or more buttons, you’re now armed with the proper knowledge to look your best in all situations! Enjoy for now, fellow gentlemen. More Suit School to follow! Please message me on the Art of Manliness Community if you have specific questions or ideas for future Suit School topics!